Generally I am in the habit of saying yes to things. Almost anything, especially if I think it's going to be fun or challenging and even if I know it's a bad idea. I firmly believe there are endless possibilities in saying yes but not much can happen when you say no. My first fling with colour began over a year ago with an email from stylist, Christine Rudolph, whom I've had the pleasure of working with over the past few years. We both love muted, earthy, raw colours but she wanted to do something different for an upcoming cook book project. 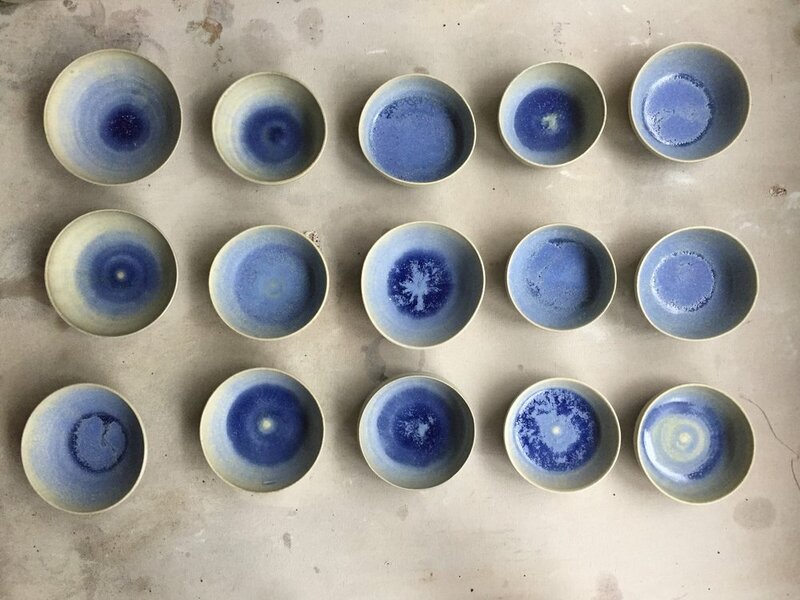 She asked me if I'd be interested in making some bowls and plates in a range colours. I don't work in colour. I have never worked in colour. Mostly I don't like colour, it scares me. So I said yes. I made some small batches of pinks, yellows, blues and greens, sent them off and promptly returned to my muddy palette without thinking about colour again. The cook book, Downtime- Deliciousness at Home, was for Nadine Levy Redzepi, it just came out in October. This past year, I had a full on torrid affair with colour following another email from Christine. She had been tasked with co-ordinating the ambitious ceramic collection for René Redzepi's (Nadine's husband) new Noma 2.0. A collection to be produced by 5 potters from 3 countries, spanning 3 seasons and totalling over 6000 pieces once completed. I am not a production potter. I don't keep glaze notes, I have a short attention span, I dislike routine, I don't like consistency, I am a terrible delegator, I have a small messy studio and an even smaller kiln. I am disorganized, fairly inefficient and I don't work with colour. I thought about all of these obvious reasons to say no and of course, I said yes. Here is a little visual diary of the process over the past year. I am so proud to say that so far, I've managed to pull it off! (although it's not done yet.) At times I was so terrified I would fail that I couldn't sleep for days but I will remember this time in my life as my absolute happiest. 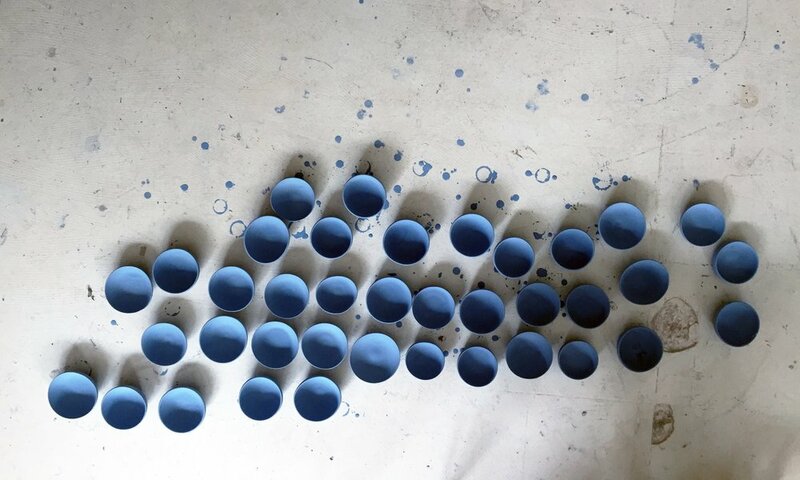 I loved the endless hours spent in the studio throwing bowls. I threw thousands of them and I am still not sick of it, I want to throw more. I learned discipline, some consistency, time management but mostly I learned to trust myself and that yes; saying yes opens more doors for learning and opportunity than saying no ever will. Thank you to my two assistants Toby and Mark for keeping me company and sharing my favourite time with me. Thank you Christine for everything, especially our time spent on Bornholm. Thank you René for pushing your boundaries to their limits and in turn, broadening the boundaries of those around you. It has been an incredible gift to be a part of this project! My temporary glaze making studio in Copenhagen. On the morning drive to the ceramic factory on Bornholm Island. A huge thank you to Jeanette and her team at Den Danske Keramik for producing over 800 dishes on my behalf. It was like the best dream to spend a week on Bornholm Island glazing them all. Thank you Pernilla and Peter for having me stay at your beautiful farm. Thanks Christine for sanding my bottoms and for Italian studio picnics! Congratulations to the other potters, Anette Krogstad, Astrid Schmidt, Finn Rasmussen, and H. Jorth Fabrik, I can't wait to meet you all!